In order to stay in power, Stalin murdered everyone he suspected might threaten his absolute power even in the slightest, not just political enemies. From Karelia to Mongolia - death squads patrolled the countryside, and minorities were at the top of the hit list. Phoney charges were laid, and executions followed swiftly. 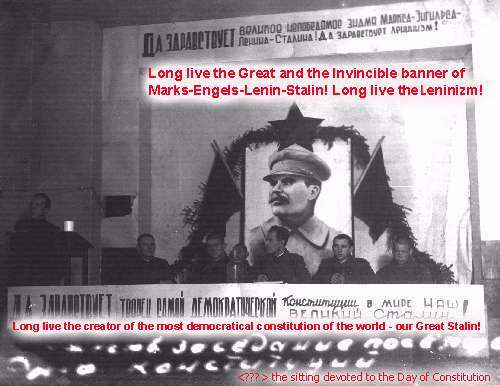 Lenin valued Stalin's ruthless vicious cruel streak, a quality his other colleagues came to dislike and which they took to be the dominant factor in his character. Some argue that Russia survived only because of Stalin, and that there simply were no leaders in Russia capable of leading Russia in time of war. Perhaps, but it is no thanks to Stalin, who killed all threats to his sole power. In Stalinist "democracy" you could vote one of your own to be shot, and millions were. This is the kind of democracy that American founding fathers warned against. No absolute laws controlled these "Advanced" Marxist Stalinists, for they are free to make their own, unfettered by old moral laws. But is it advanced to lower yourself to the level of an animal fighting other animals tooth and claw for supremecy, trying to exterminate your opposition wherever and whenever possible? Picture (translated) captured in Viipuri by the advancing Finns 1941. This photo (and more to come - check Antti's Photo Gallery) is an original - in the family collection. All rights reserved. While slavery was abolished in England in 1833 and in America in 1865, it was introduced into the Soviet Union in 1928 - by Stalin. Labour shortages were no problem for Stalin who arrested people and sent them to work camps and mixed in with them criminal elements that preyed on them day and night. The state was infinitely more cruel to slaves than any private slave owner, without compensating benefits to the state. The whole Soviet system suffered because of this - there was no net gain - which begs the question: why was it established? There was no benefit to the state using unpaid slaves as opposed to letting the slaves go and hiring them back under private contractors. How efficient is it to use sledge hammers to break rock as opposed to jaw and cone crushers? It makes no sense unless they were extermination camps, which means that Stalin murdered many more people than we think. Slavery just grew and grew until in 1941, 25% of Soviet economy was dependent on this slavery system. United States executive order No. 11,000 (+11,002) allows the government to organize people into work forces, or slave labour gangs. From the first page of the linked document that follows, the author begins to reveal the list of Karelians and Finns who were murdered by Stalin between 1937 - 1938 and were buried secretly at Sandormohi which was described in a previous article (Carelia 1/1998). The list has been compiled by the Memorial Club member Juri Dmitrijev, who has spent many hours in the Karelian Defence Committee archives studying records from Stalin's purges. As a final humiliation to the Karlians and Finns, their names would be recorded as Russian names. Gustav — Kustaa, Kyösti, Kustavi etc. For Yrjö, the Russians had 3 choices: Jegor, Georgi or Juri. In brackets are the changes from the Finnish first, father's and family and place names. Some names have been corrected. The list has been compiled by Eila Argutin and Mayme Sevanderi. Many people will probably find a relative or friend who has disappeared in this list, and come to know what happened and where they are buried. Juri Dmitrijev continues his search. Sandormohi does not appear to be the only place where Stalin's victims are buried in Karelia. The List of Finns and Karelians (may they rest in peace) shot by Stalin - note that the Russian web page has been deleted. The names are no longer of interest to the Russian people - now Stalin is known just as an "effective leader." The list is from the Internet Archives, you see nothing disappears from the net, even Stalin's inhumanity to man.